A regular breeding species and migrant; the Yellow Warbler was an abundant species during the Minnesota Breeding Bird Atlas (MNBBA). During the breeding season, the entire Yellow Warbler complex can be found as far north as the southern edge of the Alaskan tundra and as far south as Columbia and Venezuela in South America. Although somewhat more limited in scope, the breeding range of the migratory northern Yellow Warbler stretches from northern Alaska south across Canada, the central United States, and the northern regions of many southern Atlantic and Gulf coast states. Populations extend further south in the western U.S. and are present also in Baja California and through central and western Mexico. In North America, breeding populations reach their highest densities in the northern Great Plains but are also fairly abundant in scattered locations throughout southern Canada, in the Great Lakes Region, and in several western states (Figure 1). The migratory northern Yellow Warbler is a long-distance migrant that winters in Central America and northern South America. Two other recognized populations are year-round residents in the Caribbean (the Golden Warbler), and in Central America and South America (the Mangrove Warbler). An insectivore that obtains most prey by gleaning foliage and bark. Occasionally it also employs hawking and hovering strategies. An open-cup nest placed in a small tree or shrub usually located less than 2 meters above the ground. Breeding distribution and relative abundance of the Yellow Warbler in North America based on the federal Breeding Bird Survey, 2011–2015 (Sauer et al. 2017). Aptly named the Yellow Warbler for its intense and striking plumage, this species was considered by Bent (1953) to be the best-known member of the large and diverse family of wood warblers. Unlike many warblers that reside in the remote corners of the boreal forest, the little Yellow Warbler is equally at home in more developed landscapes, where opportunities to encounter it are common. A sparse little thicket of hazel or wild-rose, beside some tiny lakelet far out on the prairie-ocean, is all the invitation it requires to tarry awhile and establish its summer home. Everywhere it adapts itself most readily and cheerfully to the environment, however diversified, and in consequence forms a very considerable portion of the avian population in almost all localities. He believed it was a close contest between the Common Yellowthroat and the Yellow Warbler as to which species was most abundant in Minnesota, but he gave the advantage to the Yellow Warbler. At the time, confirmed nesting records (nests with eggs) were available from 10 counties stretching from Jackson, Lincoln, and Pipestone Counties in the southwest, north to Becker, Grant, Otter Tail, and Wilkin Counties in the northwest, and east to Goodhue, Hennepin, and Isanti Counties in east-central Minnesota. Nesting reports were also available from the Mille Lacs and Leech Lake regions in northern Minnesota and from Big Stone Lake in west-central Minnesota. Green and Janssen (1975) and Janssen (1987) also noted the Yellow Warbler’s statewide distribution but stated it was least abundant in the heavily forested landscape of north-central and northeastern Minnesota. Janssen (1987) included a statewide distribution map that identified 40 counties where Yellow Warblers had been confirmed nesting since 1970. Hertzel and Janssen (1998) later added 10 more counties to the list. By 2014, the Minnesota Biological Survey (MBS) had documented 1,979 breeding season locations. Although the MBS had yet to survey the Northern Minnesota and Ontario Peatlands Section, it reported numerous locations throughout the remainder of north-central Minnesota and St. Louis County. Scattered records were also found in Cook and Lake Counties (Minnesota Department of Natural Resources 2016). MNBBA participants reported a total of 5,333 Yellow Warbler detections from 58.0% (2,762/4,765) of the surveyed atlas blocks and from 71.9% (1,681/2,337) of the priority blocks. Breeding evidence was gathered from 290 (6.1%) surveyed blocks (Figures 2 and 3; Table 1). The birds were observed in all 87 Minnesota counties, and breeding evidence was reported from 65 counties (several blocks with confirmed nesting straddled Brown and Nicollet Counties; 1 straddled Lac qui Parle and Big Stone). Twenty-one counties were additions to the list published by Hertzel and Janssen (1998). Although found statewide, records were sparse in Cook, Koochiching, and Lake Counties in northern Minnesota and in the southwestern corner of the state (Figure 2). A primary challenge for MNBBA surveyors was distinguishing the songs of the Yellow Warbler and Chestnut-sided Warbler. Their songs can sound quite similar to one another. In areas where both species occur, it can be difficult to discriminate between the two. In fact, in areas of co-occurrence, Chestnut-sided Warblers are known to countersing with nearby Yellow Warblers just as they would with other Chestnut-sided Warblers (Dunn and Garrett 1997). As a result, Chestnut-sided Warbler records reported outside of their primary range in northern Minnesota were examined closely and many were invalidated as likely misidentifications. The distribution map generated with MNBBA data predicts that high Yellow Warbler breeding densities are located in a broad band of central Minnesota that stretches from the outskirts of the Twin Cities north through the Tallgrass Aspen Parklands Province (Figure 4). South of this region high densities also are predicted along both the Mississippi and Minnesota Rivers as well as in scattered pockets in west-central, southwest, and south-central Minnesota. Densities are lowest in the center of the Twin Cities metropolitan region and in northern Minnesota from Koochiching County east. As is the case with other shrubland and young forest species, the area of the 2007 Ham Lake fire in northern Cook County stands out as an area in the extensively forested landscape of Cook County that can support young forest and shrubland species like the Yellow Warbler. At the turn of the century, Roberts (1932) thought the Yellow Warbler might be the most abundant warbler in the state, just nudging out the equally abundant and widely dispersed Common Yellowthroat. Whether the Yellow Warbler was ever that abundant is hard to know, but today the species has clearly dropped to third place behind the Common Yellowthroat and Ovenbird. Analyses by state and federal biologists estimate the Common Yellowthroat is represented by nearly 4 to 6 million more birds in the state then the Yellow Warbler. Reflecting these estimates, nearly 4,300 more Common Yellowthroat detections were reported during the atlas than were reported for the Yellow Warbler. The Common Yellowthroat also was detected in 1,119 more atlas blocks than the Yellow Warbler. The Ovenbird was just slightly more common than the Yellow Warbler, with 422 more detections. Historically, biologists believe the current range of the Yellow Warbler, including all its various subspecies, has remained relatively unchanged over time. However, as landscape changes have modified available habitats by clearing the eastern forests, eliminating riparian forests and thickets, and abandoning farmlands to succeed to woodlands, the species’ abundance has likely waxed and waned considerably (Lowther et al. 1999). Today, however, it is an abundant and widespread species throughout the Upper Midwest. Breeding distribution of the Yellow Warbler in Minnesota based on the Breeding Bird Atlas (2009 – 2013). Summary statistics of observations by breeding status category for the Yellow Warbler in Minnesota based on all blocks (each 5 km x 5 km) surveyed during the Breeding Bird Atlas (2009-2013). Summary statistics for the Yellow Warbler observations by breeding status category for all blocks and priority blocks (each 5 km x 5 km) surveyed during the Minnesota Breeding Bird Atlas (2009-2013). Predicted breeding distribution (pairs per 40 hectares) of the Yellow Warbler in Minnesota based on habitat, landscape context, and climate data gathered during the Minnesota Breeding Bird Atlas (2009-2013) using the General Linear Modeling method with an adjustment for detectability. The Yellow Warbler can be found breeding in a variety of habitats, including brushy riparian thickets, young successional forests, orchards, shelterbelts, abandoned fields, and idle pastures (Figure 5; Lowther et al. 1999; Dunn and Garrett 1997; Danz et al. 2007). Despite using this diversity of habitats, the species is most closely associated with wet, riparian thickets of willow and alder. Even the smallest wet area among an otherwise developed landscape will invariably support a pair of Yellow Warblers if willows and alders are present. Although the Yellow Warbler occupies woodland edges and young successional forests throughout much of the state, in northern Minnesota there are many forest species that specialize in such forest communities, including the Chestnut-sided Warbler, Mourning Warbler, White-throated Sparrow, Nashville Warbler, and Veery. Perhaps, in light of the competition, the Yellow Warbler, when present in the forest landscape, is more often restricted to wetland thickets. In a study of forest birds on the four national forests in northern Minnesota and Wisconsin, Yellow Warblers were most abundant in lowland shrubs (Niemi et al. 2016). Statewide, the primary habitats that occurred within 200 m of MNBBA point counts where Yellow Warblers were detected were marsh and wet meadows followed by shrub wetlands and upland grasslands (Figure 6). Typical breeding habitat of the Yellow Warbler in Minnesota (© Lee A. Pfannmuller). Habitat profile for the Yellow Warbler based on habitats within 200 m of point counts where the species was present during the Minnesota Breeding Bird Atlas (2009-2013). Statistical analyses using data collected by the federal Breeding Bird Survey (BBS) generated a global population estimate of 92 million breeding adult Yellow Warblers (Rosenberg et al. 2016). In 2013 Minnesota was estimated to support 1.4% of the continental population, which would place the current statewide estimate at approximately 1.3 million individuals (Partners in Flight Science Committee 2013). Statistical analyses that incorporate the MNBBA data, however, generate an estimate that is nearly 8 times larger, at 8.1 million breeding adults (95% confidence interval of 7.4 to 9.0 million adults). As abundant as the Yellow Warbler is in Minnesota, it reaches even higher breeding densities elsewhere within its breeding range. In Minnesota, an average of 7 warblers are detected on BBS routes in the state each year. Across the BBS survey region in Canada, the average is 11 birds per route. In the United States, numbers are also high in New England, where New York leads with an average of 29 birds per route, and in the northern Rockies, where Idaho leads with an average of 15 birds per route (Sauer et al. 2017). In Minnesota, local breeding densities on the Chippewa and Superior National Forests average 0.72 pairs per 40 ha on the Chippewa, and 0.05 pairs per 40 ha on the Superior. Both forests are north and east of the species’ primary breeding range in central and northwestern Minnesota, where breeding densities are predicted to be much higher (Figure 4). Across the BBS survey area of southern Canada and the continental United States, the Yellow Warbler has been experiencing a steady and significant annual decline of 0.61% per year since 1966 (Sauer et al. 2017). Since 1970, this represents a cumulative decline of 20% (Rosenberg et al. 2016). Minnesota has witnessed quite a different scenario with the statewide population significantly increasing at a rate of 0.83% per year (Figure 7). The factor most frequently cited as responsible for local population declines is the loss of wetlands, riparian buffers, or other shrubby habitats due to development or more intensive agricultural practices. Other contributors include nest parasitism by Brown-headed Cowbirds and collisions with communication towers and buildings during migration. Population increases are often attributed to wetland protection and the species’ adaptability to a variety of habitats (Lowther et al. 1999; Cutright et al. 2006; Rodewald et al. 2016). 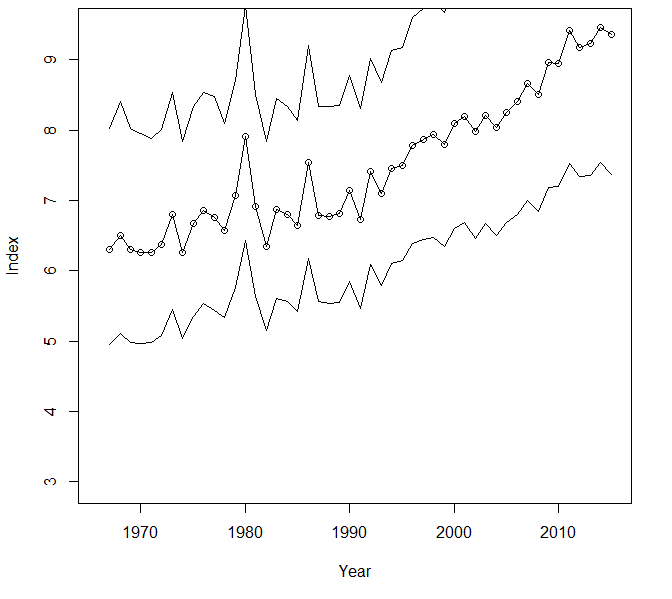 Breeding population trend for the Yellow Warbler in Minnesota for 1967–2015 based on the federal Breeding Bird Survey (Sauer et al. 2017). Although the Yellow Warbler has experienced a cumulative, long-term decline, its large and widely distributed population has yet to raise the concern of conservation biologists. The species is not listed at the state or federal level, and it has been assigned a relatively low Continental Concern Score of 8/20 by Partners in Flight (Rosenberg et al. 2016). The 2010 “State of the Birds” report classified it as having a low vulnerability to climate change (North American Bird Conservation Initiative 2010). An inhabitant of a wide variety of young brushy habitats in both uplands and lowlands, the Yellow Warbler clearly has and continues to find suitable habitat throughout the state.